While the first team offseason was fantastic, they still did not manage to score a touchdown. However the first team defense was outstanding as they cause two three-and-outs. Unfortunately, the fans only got to see the starting unit for six plays. This is good since they were extreme effective, but bad since they did not get a lot of reps.
Tonight was the first step in transforming the Eagles from a mediocre defense in 2009 to a top unit in 2010. Eagles defensive leader’s Stewart Bradley and Quintin Mikell played a major part with their playcalling at the line and leadership. Defensive coordinator Sean McDermott was impressed with all of his units and rookies safety Kurt Coleman and cornerback Trevard Lindley. More importantly, CB Ellis Hobbs had a very eye-opening performance in just a limited amount of plays. "I like how they came out. They played intense football and they swarmed. There's a lot of work we've got to do yet, but I was pleased with the starters." 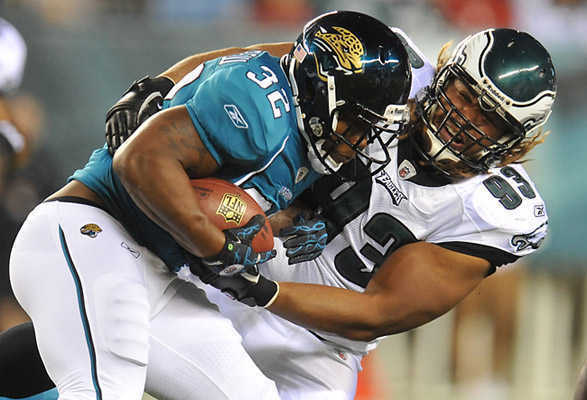 "We want to come out and be a good tackling defense. The players are working their tails off and I think we tackled well as a group tonight." "We go according to Coach Reid's plan and I was happy that we came out healthy, with the starters at least. We've got some other injuries going on here but I was happy that we came out healthy overall with the first group." "Well it looked like we made some plays. We've got to get a couple things corrected with the two passes over the top of the defense, two big plays. You take those away and I thought overall the effort was pretty good. But you can't give up big plays. We've got a lot of work to do. I was happy with the starters. I was happy that, with field position, when we had our backs up against the wall, we won that battle by holding them to field goals. But we can't give up big plays." "I just wanted to see everybody flying around, getting their assignments, getting to the ball. It's the first preseason game so there will be mistakes but as long as we have guys getting to the ball, guys playing physical, that's what I wanted to see. And we showed that tonight." "That's what we wanted to see tonight. We're going to get more burn next week against the Bengals. We have a big test with their passing game. We're just going to notch it up a little bit every week." "Anytime you come out there and play like we did, make plays on the ball, make tackles. That's a physical team and anytime we come out and just play physical and get the three-and-outs, that's big." "It is what it is. It's preseason. At this point, I'm used to it. Obviously it's a progression. We'll play more next week. The passing game is going to be tough next week. I think that will be the real test to see what we can do." "It's a new team. There's a lot of young energy and you could see it out there. Guys are out there having fun and flying around on both sides of the ball. I think that was pretty impressive for the first game. There were not a lot of wide-eyes. Guys were ready to get the job done and that was a good start." "He looked good. He has been impressing me all camp. Coming into the game, I really didn't even have to say anything to him. He's so calm and cool with everything so he did a good job out there. We didn't see a whole lot of new stuff but we'll get a bigger test next week." "We can't really take too much from it, but at the same time, the thing that impressed me the most was guys getting to the ball, having fun and playing. That's what we want to do -- just fly around and be physical, and have fun out there. And that's what we did." "Obviously when you haven't looked at the film yet, you just go off the surface -- three-and-outs, that's very good. But I'm pretty sure there are mistakes within that, from myself and other players. You have to go back to the film and I think any person in the NFL is going to be a hard critic on themselves. You should be your worst critic. When we get back to the film room, everybody should grade themselves on the hardest scale." "For a defense, it is, anytime you can get three-and-outs. I think what the starters did on defense was a good job of executing what we wanted to do, keeping it very simple and basic, and just executing what we've been running all of camp." "It's always good to get that first game under your belt because you can't really explain it to a younger player. They have to experience for themselves the speed of the game mentally as well as physically. Just letting them see for themselves that this is why you're called a professional. This is why only a select few of us can do it. You just go through the preseason now and try to minimize all the mistakes you can." "Yes. It's nice to be out there and check that off the list." "It was short-lived, but it was as good as you can expect for preseason." "I'll look at the film. It's tough to get a good evaluation with so few plays, but obviously guys are executing their assignments and we're flying around the ball and good things are happening." It is good to hear the coaches get so fired up about the first pre season game but as a fan I wasn't that thrilled. Expand the regular season.